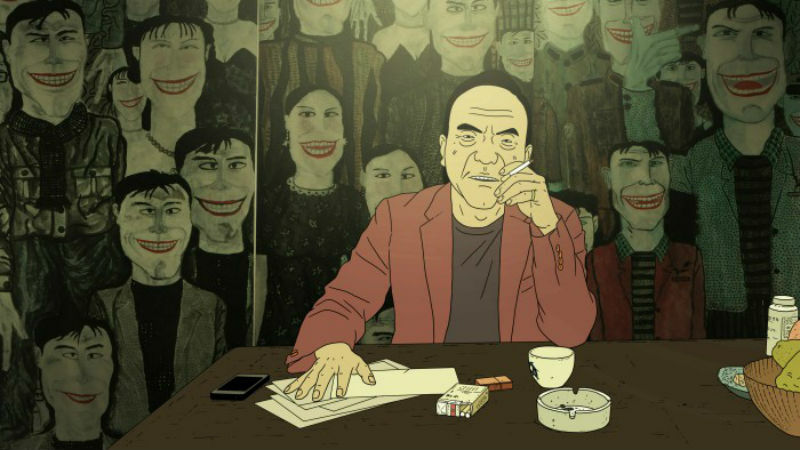 Dilapidated buildings, cracked walls, chipped doors, neglected railway tracks, shabby cars, mangy dogs, plenty of rain and blood: this is more or less the filthy image of China that will you see in this highly imaginative animation and black comedy from the People’s Republic. Have a Nice Day premiered today at the Berlinale (when this piece was originally written, and it’s a breath of fresh air plus a welcome break from a streak of stern and languid pieces such as the Korean On the Beach at Night Alone (Hong Sangsoo) and the Portuguese Colo (Teresa Villaverde) in the Festival’s Competition). The movie looks almost like a rotoscope animation due to the realism of faces of places, but a few dissonant elements effectively cater for the more ingenious and resourceful side of the endeavour. There’s a thin line of smoke coming up undisturbed from a cigarette, there are paintings with a very different texture and there’s a very plush allegorical montage blending dreams with symbols of pop culture (from which the image above was taken). And there’s cheesy Chinese music to top it all up, sometimes coming from bad quality speakers, as if you were in a student’s room. The premise of the film is rather simple. A bag with one million yuan is enough to change the life of anyone who comes across it. These greedy Chinese commoners will lie, cheat, run and kill in order to keep the money and fulfil their capitalist fantasy: to give up work, to pay for your girlfriend’s plastic surgery or to move to the promising Shangri-La. Needless to say, their plans go terribly awry and these people one by one encounter a very bloody fate. Failed communist ideals turn into violence. These people literally go from red to red. This is the parody of the ambitions of a country stuck between its communist legacy and a megalomaniacal consumerist dream – which turns out to be a bloody nightmare! One of the most interesting dialogues of the film reveals the absurdity of modern Chinese philosophy, when a man lectures a friend about the three types of freedom: farmer’s market freedom, supermarket freedom and online shopping freedom. It does seem indeed that the life of the Chinese revolves around purchasing. No wonder they will do anything for one million yuan! The film also jokes about our very own failed capitalism and ambitions in the UK, when a character asks another one: “Why do you want to go to England? It’s not even part of Europe anymore!”. 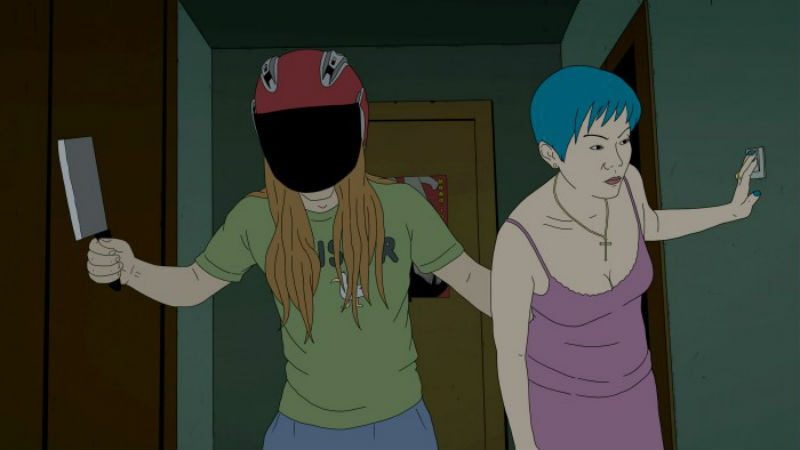 What’s most remarkable about Have a Nice Day is how it successfully transposes the aesthetics of an arthouse cinema into animation, thereby throwing in comedic elements. Some of the takes are long and still, as if there was a static camera capturing the mood of the external environment. The movements are harsh, almost spasmodic and cars drive past extremely fast, contrasting with the slow action otherwise. It’s almost as if a knife cut past the screen when vehicles and people begin to move. You will feel threatened and entranced. Have a Nice Day was in the Official Competition of the 67th Berlin International Film Festival earlier this year, but it did not take the prize from jury led by Dutch filmmaker Paul Verhoeven. This piece was originally written back then. The film was in the the 61st BFI London Film Festival taking place from October 5th to the 15th, and then the London East Asia Film Festival the following week. The film is out in US cinemas on January 26th, and then out in UK cinemas on Friday, March 23rd.